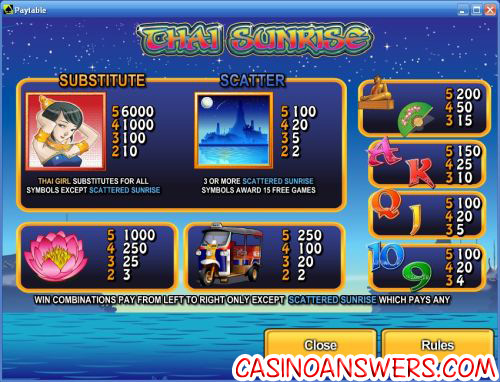 Thai Sunrise Video Slot Guide & Review - Casino Answers! Thai Sunrise is a 5-reel, 25-line video slot developed by Cryptologic, featuring wild substitutes, scatter wins, multipliers and a free spins feature. You can play Thai Sunrise at Casino Joy and VIP Casino. Start playing Thai Sunrise by setting your bet per line. Your options for bet per line are $0.01, $0.02, $0.03, $0.04, $0.05, $0.10, $0.15, $0.20, $0.25, $0.50, $0.75, $1 followed by increments of $1 all the way up to $20. You can bet a penny per spin on the Thai Sunrise slot machine or you can do the opposite and bet all the way up to the maximum $500 per spin. You can also set the number of paylines (up to 25). To spin the reels with all 25 lines active, hit “Bet Max” or just hit the “Spin” button to play Thai Sunrise with whatever settings you have. The Thai Girl is Thai Sunrise’s top fixed jackpot. If you get 5 Thai Girl symbols on an active payline, you will win the 6000 coin top jackpot. The Thai Girl is also Thai Sunrise’s wild symbol and will substitute for all symbols except for the Scattered Sunrise symbol. When the Thai Girl is a part of a winning combination, your winnings will be doubled. The Sunrise symbol is the scatter symbol. It can pay out up to 100X your total bet. All symbols in Thai Sunrise pay left to right except for the Scattered Sunrise symbol, which pays any. Three or more Scattered Sunrise symbols on a spin will award you with 15 free spins with a 3X multiplier. All of your winnings during the free spins feature will be tripled. The free spins feature can be re-triggered. During the free spins feature, the sun will come out and the game’s background graphic will change. You can win big from the free spins feature when you play at [Americans: Unfortunately due to legal restrictions you are unable to play at any of the online casinos this game is at. We recommend you trying playing the unique slots at Win A Day Casino instead.]! If you wish to speed up the gameplay on the Thai Sunrise video slot, you can modify the game speed next to your casino account balance. Game speed options consist of Normal speed, Fast speed and Very Fast speed. Thai Sunrise has an autoplay mode. You can play up to 999 autoplay spins, or you can hit the “Advanced” button for more settings. In the advanced settings, you can set the stop conditions, including cumulative win ($5, $10, $50, $100, $500, $1,000 or $5,000), cumulative loss ($5, $10, $50, $100, $500, $1,000 or $5,000), on a single win of ($5, $10, $50, $100, $500, $1,000 or $5,000) and upon completion of the free games feature. You can cancel the autoplay mode at any time by hitting the “Stop Autoplay” button where the “Start Autoplay” button once was. Thai Sunrise is a good video slot that lacks a few features such as a bonus game, but at least it has free spins and a 3X multiplier, which you definitely won’t find on every single video slot out there. You can get a 100% up to €150 signup bonus to play Thai Sunrise and many other excellent games when you sign up and make your first deposit at Casino Joy! Are US players able to play the Thai Sunrise video slot? 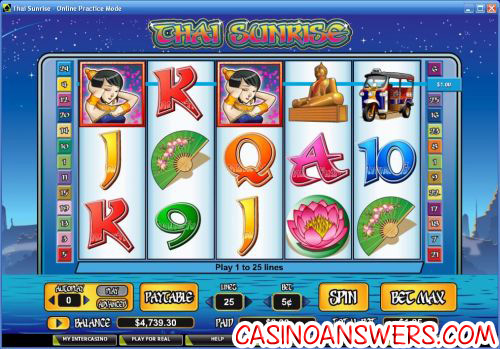 Unfortunately, online casino players from the United States are not able to play Thai Sunrise at Cryptologic casinos. For an alternative Thai-themed video slot, we recommend you try Bangkok Nights at the US-friendly Millionaire Casino. What special features can I find on the Thai Sunrise slot? Thai Sunrise has a free spins feature where you can win 15 free spins with a triple multiplier and also a double multiplier when a winning combo includes a Thai Girl wild symbol. What casinos have the Thai Sunrise Slot Machine game?